All boats are built for specific conditions and missions. It is the responsibility of the boat operator – and his alone – to operate the boat in conditions for which it was built. The height of the boat’s freeboard must match the boat’s mission. To know the appropriate freeboard, it helps to know what freeboard is, the measurement from the water’s surface to the top of the deck. If water gets into the boat, you need to get it out. For example, all boats that are kept on a dock or a mooring should have a self-draining cockpit. That means simply that the cockpit deck should be higher than the waterline so that rain water or sea water coming aboard can find its way out – by gravity – without a pump. 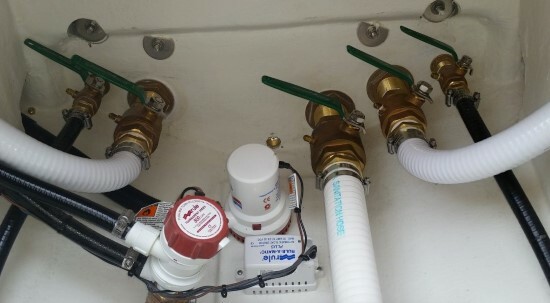 Larger boats should have appropriate capacity bilge pumps and ocean-going vessels should have emergency valves on the engine intake so that the engine raw water pump can be used for dewatering. 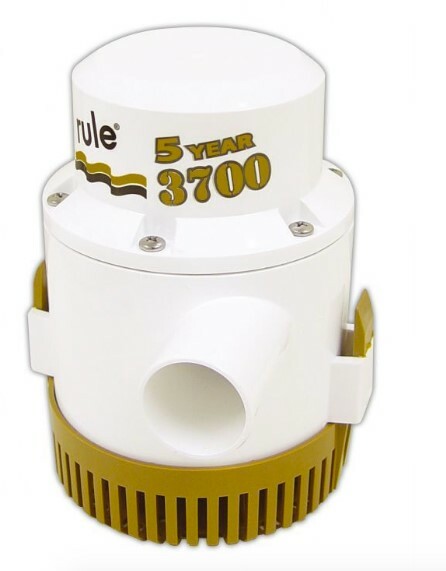 A 3,700-gph (1,4006.02-lph) bilge pump is for boats around 40’ (12.19 m) to 45’ (13.7 m) long. 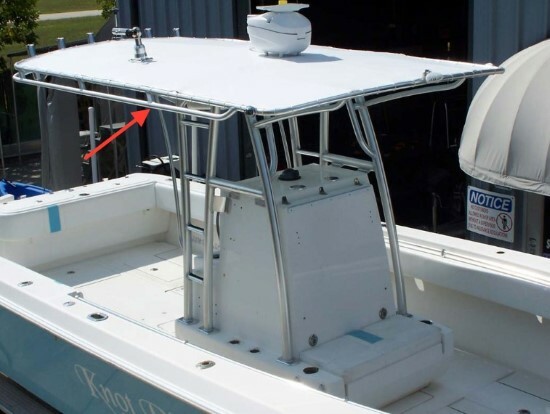 Small open aluminum boats will not have self-draining cockpits so a bucket should always be aboard for bailing. When left at a dock, these boats should be monitored. What’s missing from this picture? A bucket that would be used to bail out the boat. All thru-hull fittings below the waterline must have a marine seacock or gate valve that can be turned off in case a hose gives way. All hoses leading to a thru-hulls should have double hose clamps at both ends. 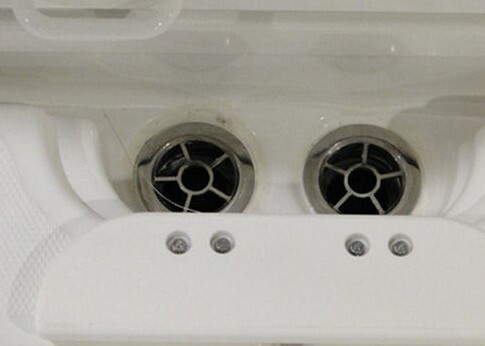 Here we see a properly installed thru-hull with a seacock valve. This sounds obvious but we are amazed every year when we find a few boats that require an orangutan to reach the thru-hull valves. A hatch in this boat’s aft deck opens to provide easy access to the through-hull levers. When metal plates with holes in them are used for cockpit drains, its usefulness is greatly diminished. 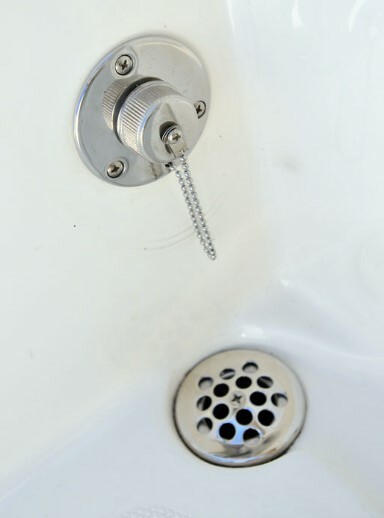 The best design in our opinion is one that allows the full interior diameter of the drain and hose to be utilized. Plates with small holes in them greatly restrict water flow. Scuppers that are accessible and have minimal restrictions allow the cockpit to drain more quickly. In our opinion, this scupper cover or gate is too restrictive. All boats should have specific marine grade hose that leads from the fuel-fill on deck to the top of the fuel tank. After each refueling the operator should check the hose junctions at the top of the tank to make sure there is no leakage. This should be done before the blower is turned on. 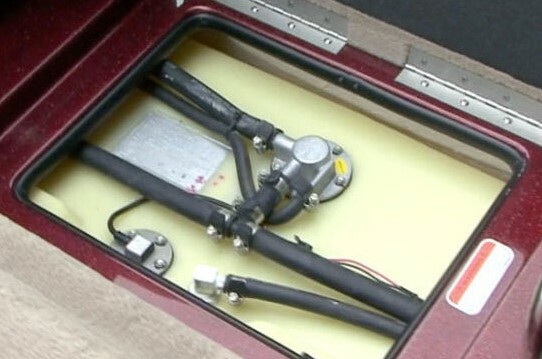 All boats should have easy access to the top of the fuel tank and associated fittings. Increasingly, builders of small boats are eliminating a dedicated locker in the bow for anchors and anchor rode. The reason is usually because they are trying to create more seating space. Furthermore, few pontoon boats have a dedicated anchor locker. In a boat with no dedicated anchor locker, a seat storage locker can be used to store both the anchor and the anchor rode. To facilitate quick deployment and eliminated tangles in the rode, this locker should not be used for any other purpose. 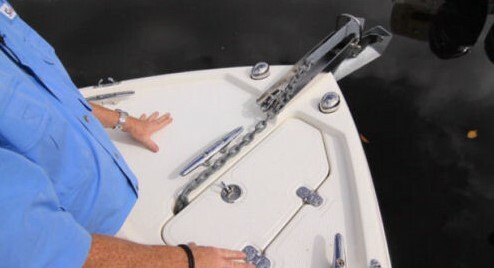 Large boats should have a large enough access to the rode locker to facilitate untangling the anchor chain or line. After a rough passage, the chain can become horrendously tangled. All boats must have an anchor and an anchor rode. The Viking 50 has twin anchor-locker hatches that make it easy to get to the rode. This is a key item of equipment that more and more builders these days are skimping on in small boats. 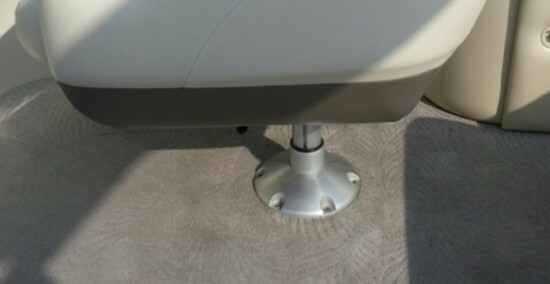 Ideally, the cleat should be on or close to the centerline of the boat. We do not favor using cleats set off to each side of the bow on the rail for the anchor rode tie-off. 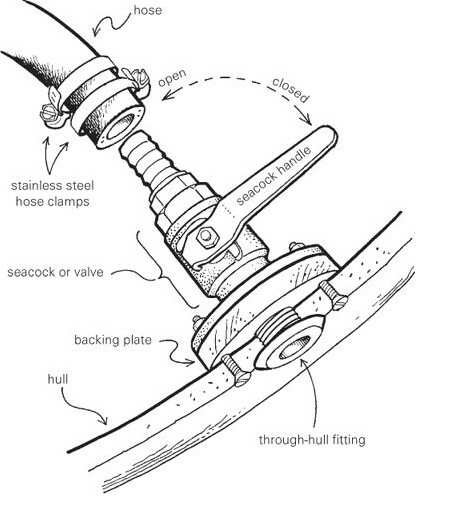 As a corollary to this, in every anchor locker there should be a way to tie the bitter end of the rode to the hull or other a secure structure. Here we see a proper foredeck. There’s a cleat on the centerline for securing the anchor rode and notice the notch in the deck for the chain to pass through. 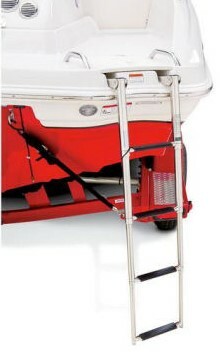 ABYC standards require that virtually all power boats be equipped with a ladder that can be reached by a person in the water – and that it extend at least 22” below the waterline. Tahoe uses four-step ladders on all its boats and it meets the ABYC standards for reach below the surface. 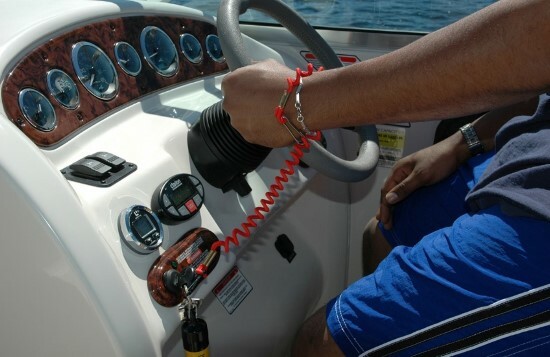 All small boats must be equipped with a kill switch that is in a location conducive to a lanyard being connected to the operator. Large boats should have an emergency engine shut off device handy to the helm. An emergency shut off lanyard or “kill switch” needs to be positioned for comfortable use. If the windshield header is at eye level when underway, the operator will never be comfortable. Either he must stand up or duck down to see forward. 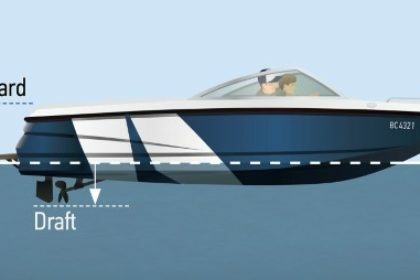 Note that most boats ride at a 3 to 5-degree bow-high attitude when on plane. As a result, what may appear to be a header at eye level at rest is actually higher on plane. Nevertheless, when idling the header should not be at eye level. 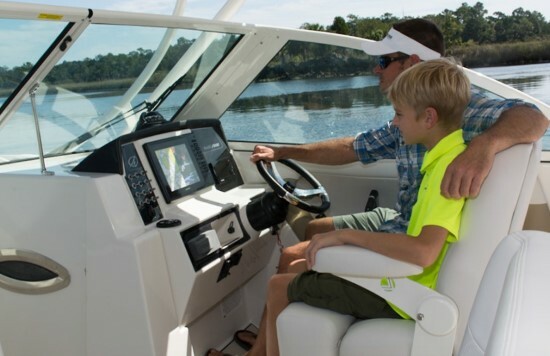 The Sailfish 325 DC’s windshield is tall enough to provide good sightlines for the captain. On large boats, particularly European-designed express cruisers, it is often impossible to stand at the helm and see out forward without bending down. Such boats require that the captain must be always seated when piloting. 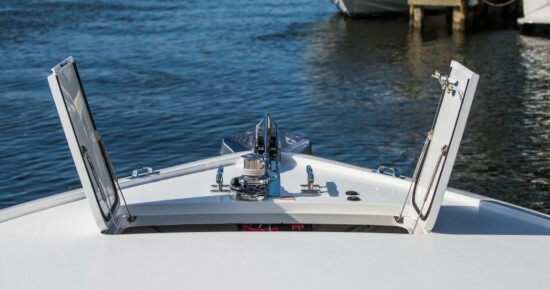 A common complaint among owners of small boats is that the helm seat wobbles. Not only is this annoying, it can also be dangerous. All seats should be ergonomically correct, which is to say – be comfortable. A large bucket seat mounted on a pedestal can be wobbly, which is at the least annoying and at the worst dangerous if it breaks. ABYC standards require that a handhold be installed for every seat on a small boat. The reason is obvious, and while most builders are careful to do this, some seats are occasionally in locations that do not lend themselves easily to the installation of handholds. Notice the stainless-steel grabrail positioned just ahead of our test captain’s right hand. Large boats designed to go offshore should have overhead handholds, something we rarely see. The rails on a T-top and its lower structure provide a number of handholds. 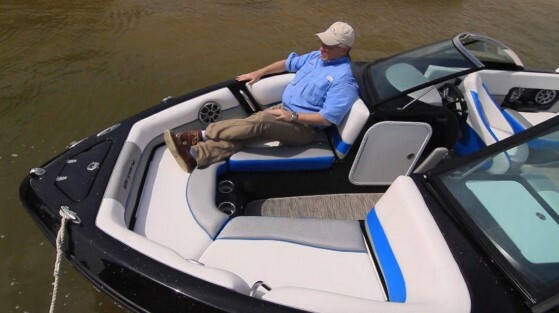 Every boat under 26’ has a U.S.C.G capacity plate by the helm that notes both the maximum horsepower for the boat and its rated capacity for passengers. 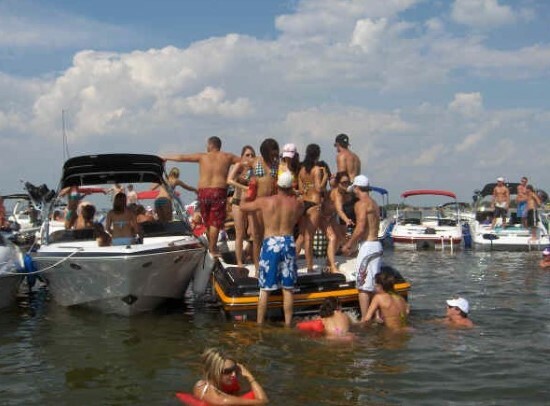 The stated passenger capacity sometimes bears little relationship to the number of seats on the boat. The reason is because the U.S.C.G uses a formula to calculate load capacity based on interior cockpit volume and an average weight for passengers of between 150 and 180 pounds (68-82 kgs). We recommend that consumers count the number of seating positions and use the smallest of that number or the U.S.C.G rated capacity. Obviously, the owner of this boat did not read its capacity plate. In boats over 26’ there is no capacity limitation in the U.S., but in Europe the CE classification changes depending on how many people are aboard. Owners of boats with a flying bridge should be careful not to overload the bridge. Some manufacturers affix plates on the stairs leading to the bridge giving its capacity.